Everyone likes to wake up to a breathtaking view and Iceland offers some of the best on the planet. Would you like to see a humbling, shimmering glacier first thing in the morning? Or perhaps you would like to sleep under the midnight sun or under the Northern Lights while listening to the white noise of a rumbling waterfall? Camping is cheap and liberating which is why it is extremely popular among locals and visitors alike. 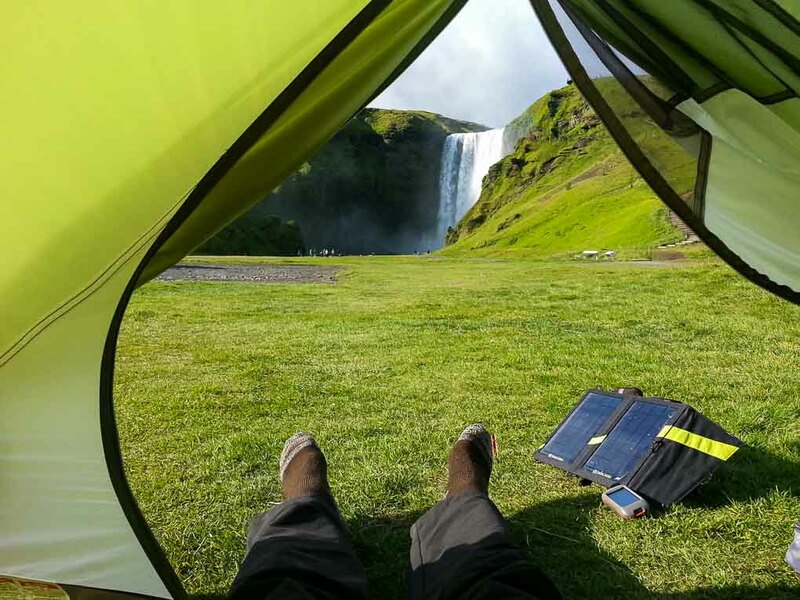 There is an old misconception that you can camp freely anywhere in Iceland which was once true. Unfortunately, it is not anymore. 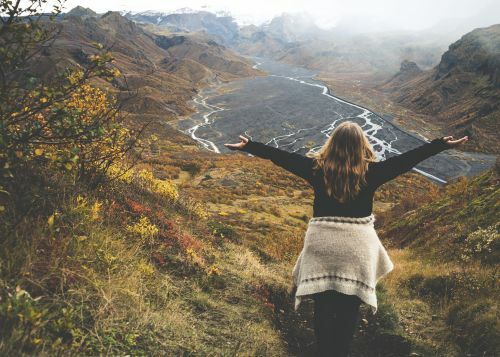 Let’s check out what options are available to you and where you can go if you would like to camp in the wild legally in Iceland. 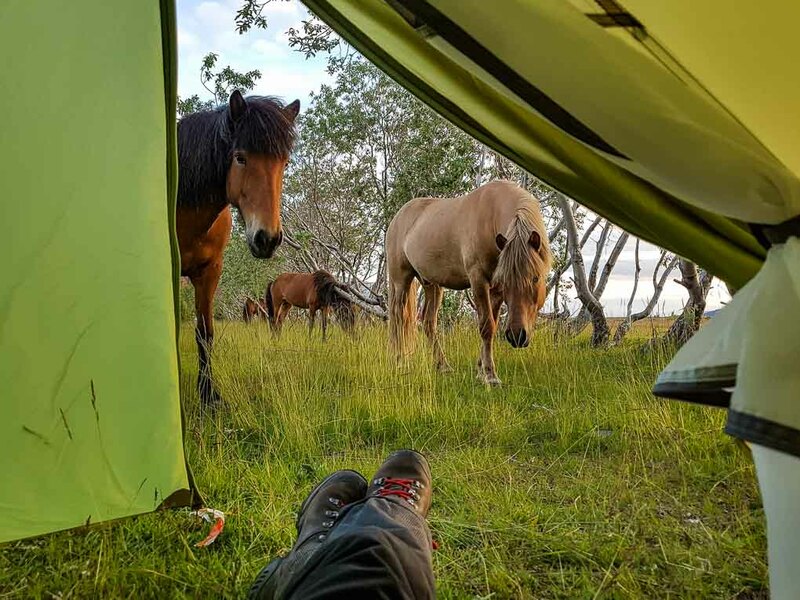 Just as Iceland has an incredibly diverse range of scenery, attractions, and wildlife, the country has a great variety of camping options to choose from as well. Following are the most popular options. The greatest advantage of sleeping in a vehicle is the ultimate freedom and flexibility. You will not need to book your accommodation in advance. You can travel spontaneously without any strict plans, and you can stop at the nearest campsite whenever you feel like! Campervans, motorhomes, and camper trailers are the most expensive way to camp in Iceland but are also the most comfortable and luxurious. In summer, the accommodation along the Ring Road can quickly become fully booked. This forces travelers to plan their trip months ahead of time. Those who travel with campervans and motorhomes can enjoy the comfort of a small apartment without restricting themselves as to how far they travel each day. Also, renting a camper could still come out cheaper than staying in hotel rooms. Especially if you plan to spend more than a week in Iceland. An even cheaper option is to simply rent a car in which you sleep or pitch a tent next to. This is quite the popular practice among budget travelers and those adventurers with a wide comfort zone. The greatest advantage of this travel style is that you can choose a car that is suitable for venturing over the roughest roads of the Highlands. Even though many would choose this travel style for the spontaneity, it is still advisable to put some time and care into planning your road trip. Make sure that you have an internet connection during your stay in Iceland. So that you can check out the nearest grocery stores, rest stops, gas stations, and campsites. Larger vehicles such as motorhomes are often not suited for rough roads such as in the Highlands. They are perfect for traveling around the Ring Road and the Golden Circle. However, it is better not to go on big detours. Driving larger vehicles requires very good experience and extra caution. Make sure to monitor the weather forecast and the road conditions, especially the wind speed. In some areas near mountains and glaciers, the winds can be surprisingly furious. Camping in a tent is the best way to connect with nature. It is incredibly popular in Iceland in summer. The abundance of campsites and their breathtaking natural setting is amazingly tempting for locals and travelers alike. 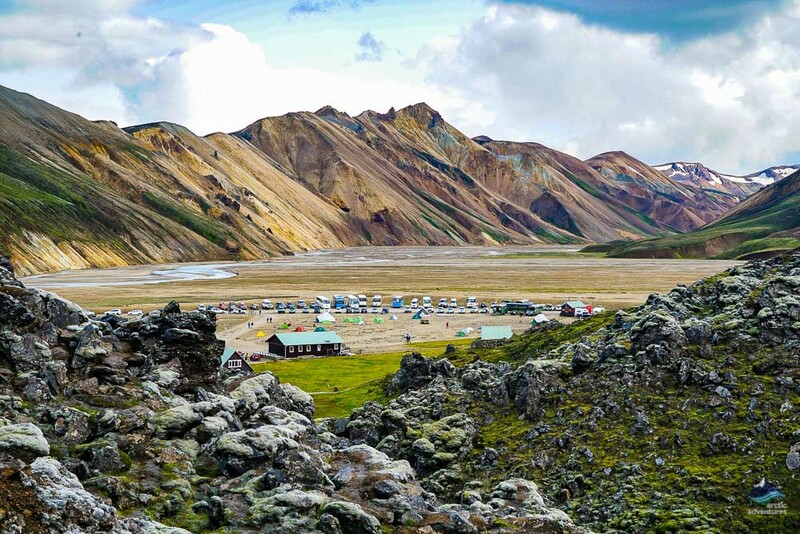 Many Icelandic campsites could easily top the list of the best campsites in the world, for sure. There is a strong interest among travelers in camping outside of the designated sites as it is generally seen as the best way to get back to nature. There is an old misconception that you are allowed to camp anywhere in Iceland, but this is, unfortunately, false. For more details on rules of wild camping in Iceland, join our Hiking Facebook group. 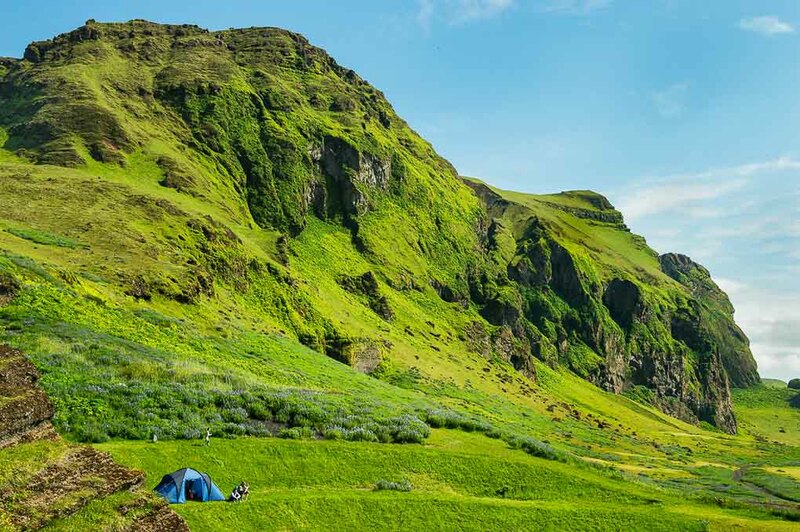 There are more than 200 campsites in Iceland. It is nearly impossible that you will not find a campsite nearby if you are driving on a paved road. 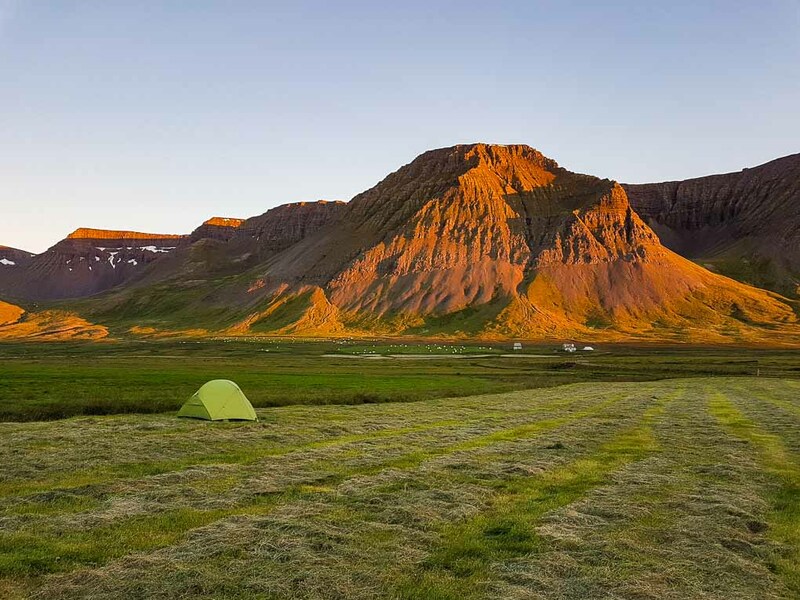 Even in the remote Westfjords, many farms offer cheap camping facilities in idyllic settings that seem to be in the middle of nowhere. Just look for their signs next to the road. Some campsites have their own geothermal pools, saunas, and playgrounds for children while others offer mind-blowing views over the ocean or the surrounding mountains. Most campgrounds are equipped with an indoor kitchen and dining area. Electricity, dryers, and washing machines are usually available for a small additional fee. At most campsites, a warm shower is included in the price, but at some places, this costs a small extra fee. All campsites accept credit cards. However, it is a good idea to have some cash with you in case your card does not work or if the card terminal has a connection problem. Most campsites are spacious but they can be filled with tents in the peak season of July. There is no need to worry, though. There will be space for everyone and you are not required to book your spot in advance. If you want to make sure to have the best spot, it is advised that you arrive early in the evening, before 7 pm. The campsites around the Ring Road are usually nearly empty during the day and get filled up for the night. 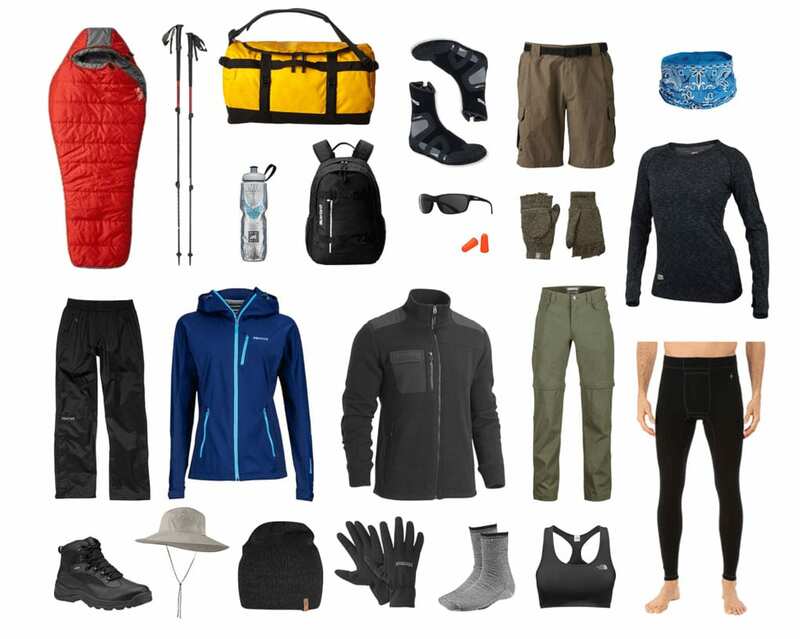 Deciding what to pack for a camping trip in Iceland depends on your travel style. Those who travel with campervans and motorhomes need less specific equipment as they are basically traveling in a small flat. However, those who sleep in a tent will need a bunch of camping gear such as warm sleeping bags, mattresses, and, of course, the tent itself. GPS, paper maps, or a map app on your mobile device. It is crucial to have GPS or at least an internet connection while you are traveling in Iceland. This is the only way you can get information on the nearest facilities. Remember to bring portable chargers and an adapter if you need one. Warm clothes and undergarments. Make sure that you have the right clothing. 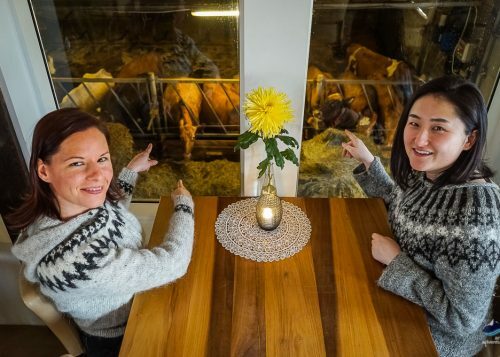 We have a great guide about how to dress in Iceland that applies here as well. Camping gear. Here is an article you can read about what kind of gear you need for a multi-day hike which also applies if you plan to sleep in a tent. You will definitely need an air mattress and a warm sleeping bag. The comfort temperature rating should be between -5 to 5ºC (23-41ºF) for those who plan to sleep in a tent. Those who plan to sleep in a campervan or motorhome should have a sleeping bag rated 5 to 10ºC (41-50ºF). A gas stove and cooking equipment. The majority of campsites offer kitchen facilities to campers, but not all of them. 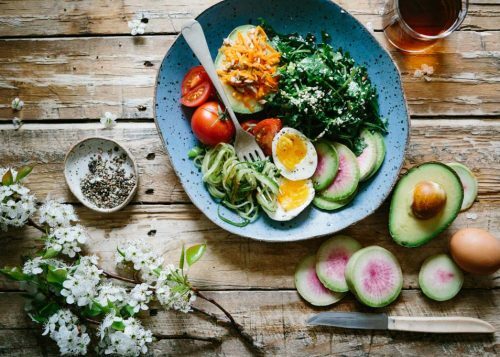 It is good to have a gas stove, cutlery, and a pan if you would like to eat something warm every day. Make sure that your gas cooker can handle windy conditions. A waterproof, windproof, 3 or 4-season tent. If you are planning to sleep in a tent, go for the best quality. A cheap festival tent will not serve you well in Iceland. The weather can be very windy and rainy, even in summer, so you will need an especially sturdy and waterproof tent. Bathing equipment. Iceland is full of spectacular geothermal pools. Basically, every little village has a warm water swimming pool which usually has a spectacular view. Always have swimming gear and quick-dry towels with you in case you decide to take a pampering bath. A USB charger. In addition to your normal charger, keep another USB charger in your car so that you can charge your phone and your camera while driving. Toilet paper and a small shovel. If you must do your business in nature, always go away, dig a hole in the ground, and cover everything – including the paper – properly. Never use the moss as a cover or as toilet paper! A water bottle. The Icelandic tap water is one of the healthiest and probably the safest you can find in the world. There is no need to buy plastic bottled water. The only thing you need is an own water bottle that you can refill at any gas station or campsite. When is the best time to go camping in Iceland? 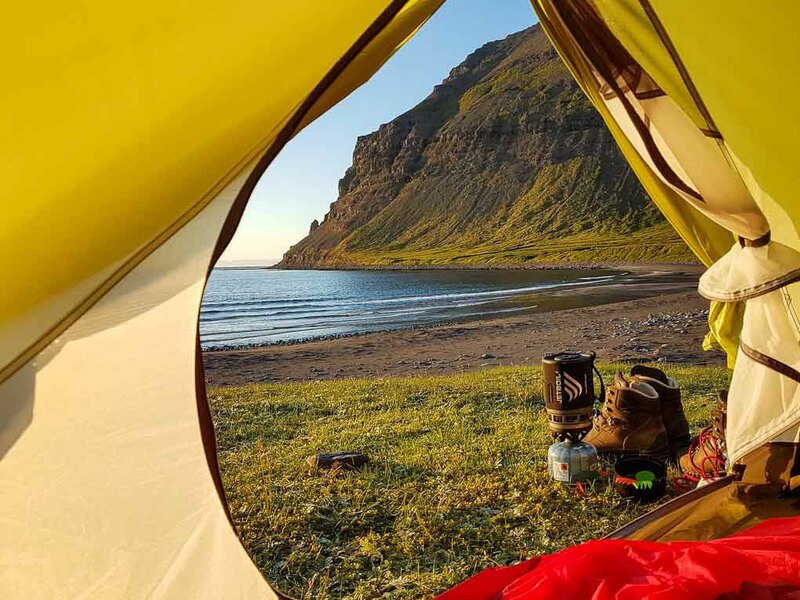 Summer is the optimal time for camping in Iceland. This is why most campers pitch their tents in June, July, and August. This is the time when the weather is the friendliest, the sun stays out all night long, and the landscape takes on its most beautiful colors. The bravest adventurers with the right equipment and experience in hostile conditions can go camping between May and October. The Highland roads, however, are only open between late June and early September. Under no circumstance do we recommend camping in Iceland during the winter. The weather gets stormy, the daylight periods are limited to 3-5 hours, and the temperatures can drop below -10º C (14º F). Generally, the Icelandic winter is not safe and not enjoyable for camping unless you are a professional, expedition-minded traveler. Renting a motorhome, campervan, or a trailer in winter is not a good idea. Most campsites are closed between November and May and you may face many unexpected challenges on the wintry Icelandic roads. Snowstorms and violent winds are common and the days can be very short. We do not recommend for anyone to drive a large van in those conditions, not to mention sleeping in one. If there is one thing Iceland has plenty of, it is beautiful and unusual landscapes. You can head in almost any direction and find somewhere worth exploring. Here are just a few areas that are popular with campers. If you want to take in as much as possible, driving the Ring Road is a handy way to see plenty of sights relatively quickly and on the cheap. The Ring Road circles the entire island over a total of 1,332 kilometers (828 miles). Traveling along this road gives you access to numerous campsites and exciting day tours such as glacier hikes, whale watching, horseback riding, and so on. The South Coast is the most visited area in Iceland. It is famous for its beautiful waterfalls, black sand beaches, and interesting coastal rock formations. In Southeast Iceland, you will be in a glacier wonderland. 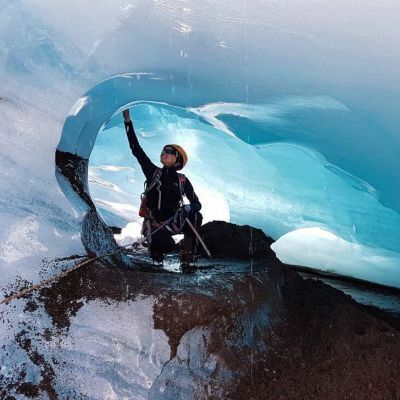 Countless thrilling glacier tongues and glacier lagoons await you. 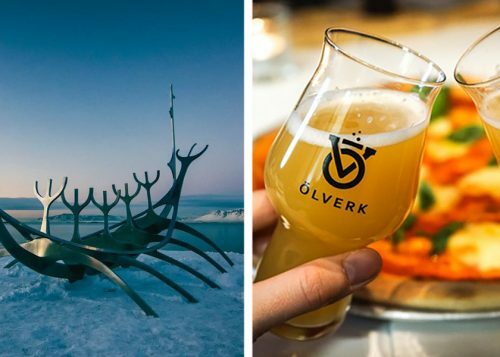 The Eastern Region of Iceland receives considerably fewer visitors but it offers equally exciting natural attractions: stunning fjords, lovely little villages, and truly spectacular views. This area is very calm and remote, but campsites can be found in every village. North Iceland has a varied landscape. Active geothermal areas, lava sculptures, wide fjords, and high mountains with flat tops are just a few of the interesting features to see. Campsites are abundant here as well. West Iceland offers the best detour options from the Ring Road with the Golden Circle being the most visited route. This is truly a must if you want to see Iceland’s biggest geyser. 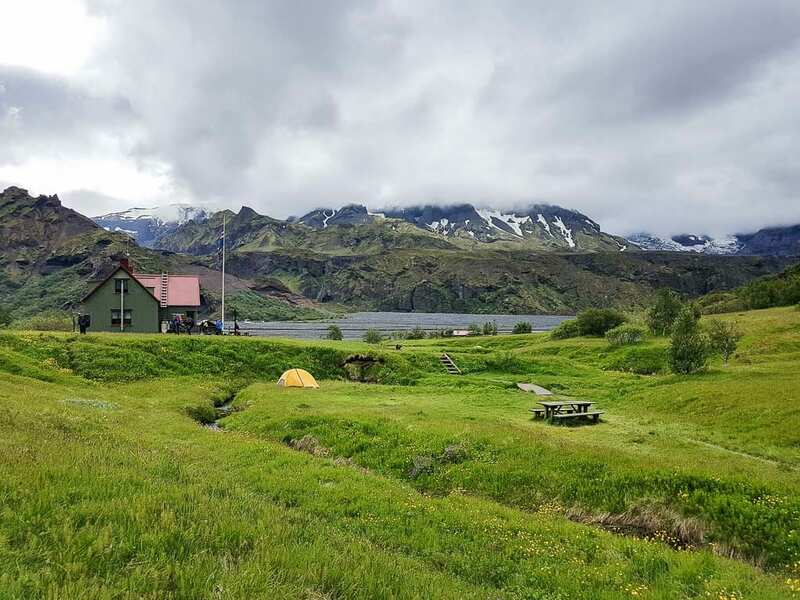 West Iceland is a well-traveled region offering great facilities for campers at many campsites. 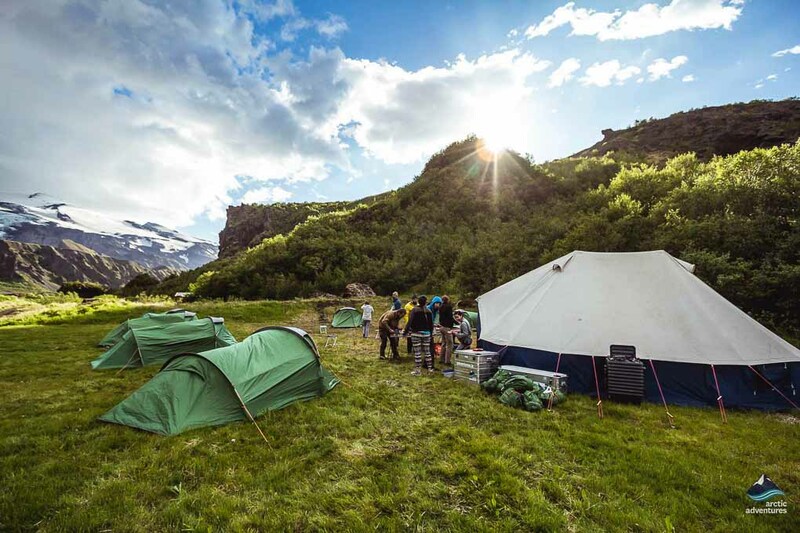 Within a 3-kilometer (1.8-mile) short cycle or drive from the city center, you will find a fully-equipped campsite sitting right next to the Laugardalslaug geothermal swimming pool. The public transport network in Reykjavík is quite good and there are bus stops right at the campsite. The Reykjavík campsite is fairly busy but amazingly equipped. There are shelves where leftovers can be shared and the variety of things available here for you to pick up is amazing. You can find random equipment items like maps, gloves, hats, jackets, and even boots, but the most common things are food as well as cooking and bathing equipment. If you are looking for a less-crowded place to stay, there are three other campsites in the capital area. The best one is the Mosskogar campsite, located outside of Mossfellbær. A new law came into effect in recent years as a direct response to the increasing number of visitors to Iceland. The Ministry of Environment and Natural Resources put forward new regulations as to where people are permitted to camp. 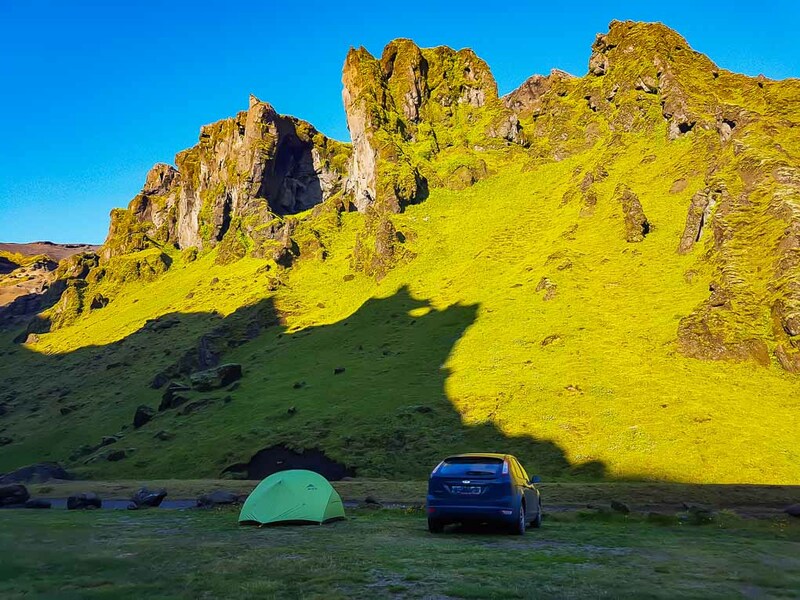 Today in Iceland, it is illegal to overnight or camp in cars, trailers, motorhomes, campervans, or any type of motorized vehicle outside of a designated campsite unless you have written permission from the landowner – which is quite unlikely that you will get if you can even find the property owner. In addition to the existing laws, the entire South Coast has banned wild camping of any kind, due to the heavy flow of tourists to the area. This includes sleeping in a tent. The popular Jökulsárlón Glacier Lagoon and the Southeast Coast belong to Iceland’s largest national park, the mighty Vatnajökull, making them protected areas as well. Please note that off-road driving is illegal in Iceland and is subject to heavy fines. Never drive off the road and do not follow any track that is not signed. Remind others to remain on the road if you see any violators. When traveling in Iceland, please follow the “leave no trace” rule. Do not leave any waste behind, not even degradable waste. Banana peels and dirty tissues have no place in Icelandic nature. Always carry your waste with you to the nearest garbage can. There is no need to say that you must plan your toilet stops wisely and try to avoid doing your business in nature where there are no trees to hide behind. No one would like to encounter your waste in parking lots or next to the fences of their farms. If nature happens to call urgently, make sure to leave a good distance between yourself and any house, farm, or hiking path. Dig a hole in the ground and cover everything – including the paper – properly. Never use the moss as a cover or as toilet paper! Do not follow trails that are not signed and do not step over any fence or rope. Please remind others to follow the rules. Many natural attractions suffer the consequences of the irresponsible behavior of those tourists who ignore the rules. Welcome to the Natural World! Iceland’s awesome outdoors are the envy of the world and its people appreciate that. That is why camping is such an integral part of Icelandic culture, both for its population and its visitors. You will definitely be awed and humbled by Iceland’s natural splendor. Hopefully, you will be inspired to leave it as you found it so that the next visitor will have the same incredible experience that you have had!